I’d watch it at least once. I wanna hear the witch’s song. Disney villains always get the best song in the movie. It’s like an unwritten law. I’m trying to think of all the Disney movies that have villain songs. The only one I can think of off the top of my head is The Lion King, and Be Prepared is definitely the best song. Gaston actually gets two – he also leads the Mob Song. Kill the Beast~! TV Tropes has an entire page for Disney on villain songs. Then again, standard warnings apply with that thing. Agreed. Even when the song gets cut from the movie. Aw, no commentary on this one? I would love to see Frau Totenkinder in a Disney movie. But then, I am a very bad man. Can’t be worse than Disney’s Anne Frank. 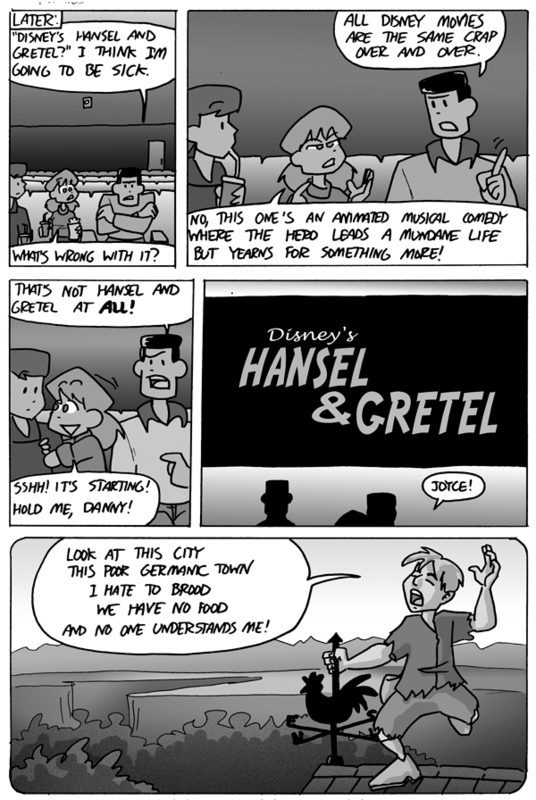 This comic is so ahead of the times, what with the Marvel and Lucas purchases by Disney, and the new Hansel & Gretel coming soon. My brain processed this and spat out Star Wars VII: Hansel and Gretchen. Or maybe Hansol and Gretchlei. WHAT HAPPENED TO HIS LEG. Aw Joe your no fun. Proud Disney Fan for years. Also I’d watch the hell outta this. Well they’re going to have to run out of princesses eventually, right?